Saul Costa is the founder of Codevolve and a computer programmer/entrepreneur since age 9. Saul has always been fascinated by high-quality tech products and the businesses behind them. After graduating early from Norwich University with a degree in Computer Science, Saul followed his passions for programming and entrepreneurship to the Bay Area, founding Codevolve soon after. When not working, he enjoys introducing others to the world of software development, hiking mountains, surfing in Santa Cruz, or working on one of his latest novels. 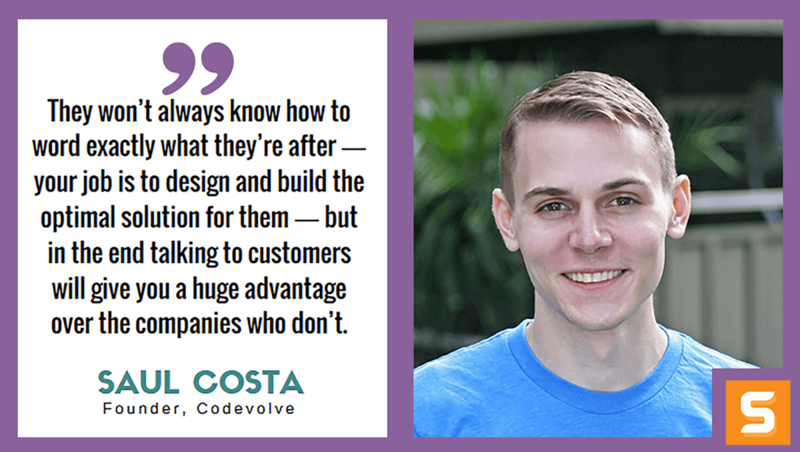 In this interview, Saul shares with Startup Savant how Codevolve was born and their secret sauce to get ahead of competition. Saul also mentions 3 things about work-life balance and the potential to grow Codevolve as a publisher of coding courses. Why did you start Codevolve? Can you tell me a little bit about your business and what you do? It was the summer of 2014 and I’d just graduated from Norwich University with a degree in Computer Science. While heading home from my dream job as a Silicon Valley software developer, I received a call from a former professor, who had a simple question: could I automate the grading computer programming projects? He touched on a problem I’d grown very interested in while tutoring other students in Computer Science at Norwich. While working with these students, I’d noticed that they didn’t struggle with the course content or instruction: it was the tools they were using to learn to code (which were designed for professional developers) that proved to be the bottleneck to their progress. So although Codevolve started with the simple initial goal of automatically grading program code, it quickly grew into a solution to this larger problem. We’ve designed every part of our product ― an online coding environment ― to make computer programming approachable for students so that they stay on track for success in this field. Around this coding environment, we also built a powerful authoring environment that allows coding courses to be created in a matter of days (instead of 6+ months, as is the case with other companies in this space). This has helped Codevolve form partnerships with education companies much larger than us very early on and has been crucial to our success. There are a number of online coding environments, many of them good ones. However, no one has built something similar to the robust set of authoring tools that we created. This has given us and our customers the power of scale when it comes to creating large amounts of high-quality coding courses. To find this niche, we simply listened to the people we talked to about our product (especially the ones who were willing to pay for it!). Early on, we added a number of features that no one really wanted (or used…), like a full learning management system (LMS) for managing courses (similar to Canvas’ software). As we listened to customers about what their true problems were, we quickly realized that it wasn’t having a better LMS for coding. It was being able to build high-quality coding labs. So in that case we ditched the LMS (deleted 10’s of thousands of lines of code in a couple nights) and instead made it possible for our users to embed Codevolve’s labs into any external LMS or website (it’s as simple as embedding a YouTube video). This way, we didn’t need to build or maintain our own LMS, but could benefit from all the other companies already doing a great job at this. Listening to your customers and reacting to their feedback is something every company should focus on. At every stage. Trust your customers to know better than you what they need. They won’t always know how to word exactly what they’re after ― your job is to design and build the optimal solution for them ― but in the end talking to customers will give you a huge advantage over the companies who don’t. Always be open to feedback (ask for it!) and use it to improve your product. Don’t let yourself burn out. Take at least one day off each week (I do Friday night to Sunday morning) to recharge and do something for yourself. Burnout is incredibly hard to recover from, so the time investment is worth it. Take care of yourself, physically and mentally. Running a company is extremely stressful on both your body and mind. Exercise and meditate daily. Even though it takes time out of your day, you’ll be able to go for longer and perform at a higher level because of it. Plan your day in great detail. I record copious amounts of structured TO-DOs and notes about each part of my day (both my work life and my personal life). This helps me optimize how I spend my time, stay focused on specific tasks, and recall important information with just a simple search in my text editor. How did you find the time and money to get Codevolve off the ground? Any advice for entrepreneurs with minimal time or resources? Codevolve has made money from the day we launched our product (which took 6 weeks from the first line of code). Not a lot ― not even enough to live on as an entrepreneur ― but this mindset has been very important to the continued success of the company. We haven’t raised any money beyond some accelerator funds, so staying revenue-focused from the beginning has allowed us to keep the company in a “default alive” state, as Paul Graham would say. Early on, when Codevolve was still a side project, time was by far the more precious resource. For the first year of working on Codevolve as well as having a full time developer job, I really didn’t do much besides work on the software. I’d get home at about 9pm from the city, work on Codevolve until 3am, then get up at 9am to head back into the city. You quickly adjust to not sleeping 8 hours a night during the week and make up for it on the weekends. I wasn’t so great at avoiding burnout back then, but I was also a few years younger, which actually made a pretty big difference. I’m very proud of some of the customers we’re partnered with. They’re very large, multi-billion dollar public companies who've placed their trust in Codevolve to deliver a high-quality product that their customers depend on. Related to this, it’s the feat of scaling Codevolve to tens of thousands of users. Executing unknown program code is a really tricky problem to solve ― especially at scale ― and we’ve invested a lot of time into building proprietary systems to handle this. Some of the problems related to this that we’ve solved are ones other companies in this space ― even massive ones with tens of million in funding ― haven’t been able to (or haven’t taken the time to). With both of these, it’s been a dedication to creating an extremely high-quality product that has gotten us this far. We’re fortunate to have had some really talented people work on Codevolve, and they’ve each done a tremendous amount to help build Codevolve’s product into what it is today. At the time, quitting my comfortable Silicon Valley developer job was kind of unnerving. Looking back, it wasn’t actually all that bad, and it’s something that needed to happen for Codevolve to succeed. Talk to people in the space. Lots of them! Find out what they’re missing from their lives, then go create it. Once you’ve done that, ask them what they think and use their feedback to improve what you’ve built. Then once they love it, make them pay to use it! We certainly went after the wrong group of customers for a time (computer science professors). To sell to them, you really need a large sales team, something that we did not (and still don’t) have. By forming partnerships with companies who have these sales teams already in place, we’re able to focus on what we’re best at (the product) and empower our partners to deliver a high-quality product to their customers. I have two role models in this space, although they’re kind of a cliche: Steve Jobs and Elon Musk. I really respect Job’s commitment to never settling for anything less than the best when it comes to his products, no matter what the cost. For Musk, I find his work ethic is absolutely inspiring, as well his intense focus on some very important problems. I see a lot of potential for Codevolve to grow as a publisher of our own courses, in addition to continuing to power our partners to build the best possible coding courses. I’ve taken a very non-traditional route with Codevolve by not raising funding and focusing on growing the company more slowly using only our revenue, but so far this has only put us in a perfect position to experiment and iterate quickly on our product and company. Everything is going to be more expensive ― developers, housing, taxes, etc. You have access to an amazing pool of resources by being out here ― use them to get ahead.